Falling leaves and cooler temperatures indicate savvy diners need to get their food truck fix in while they still can. 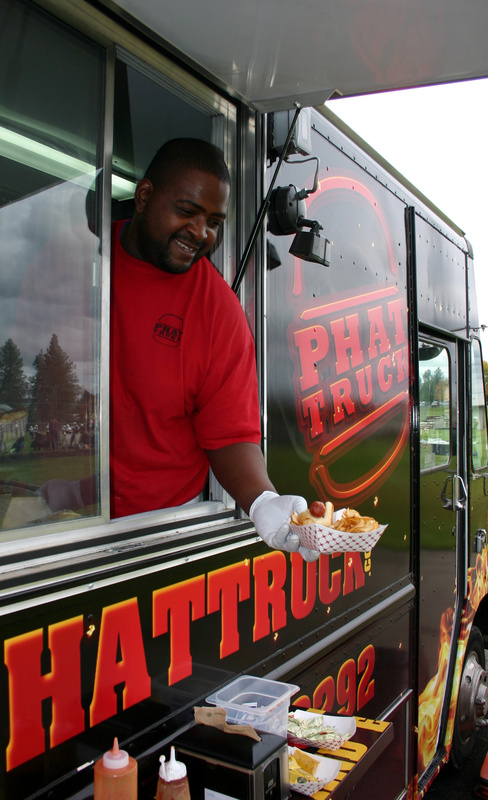 Three new mobile kitchens opened recently in Spokane, offering everything from familiar favorites like hamburgers and chicken wings, to exotic fare like stewed oxtail and curried goat. Most food trucks shutter their windows when the snow flies, but you’ve still got time to sample some tasty dishes from the latest additions to the mobile-dining scene. But it’s a labor of love for this Jamaican, who owns the truck along with his wife, Sabrina Sorger. Using spices imported from his homeland, Doctor offers authentic dishes like jerk chicken – smoked meat that’s rubbed with and marinated in a special blend of spices. “I’m giving you a taste of what I’m familiar with,” he said. Jerk chicken and curried chicken are always on the menu, as well as side dishes including rice and beans and cabbage salad. Doctor also serves festival – a fried bread, similar to Indian fry bread. “All of my side dishes are vegan,” he said. Adventurous eaters might want to try stewed oxtail. Doctor describes it as “a big chunk of meat with some gravy on it.” He also occasionally serves curried goat. The honey-citrus shrimp skewers have proved popular, too. Prices range from $5.50 for a bowl of curry chicken with rice and beans to a jerk chicken combo plate with three sides for $10. 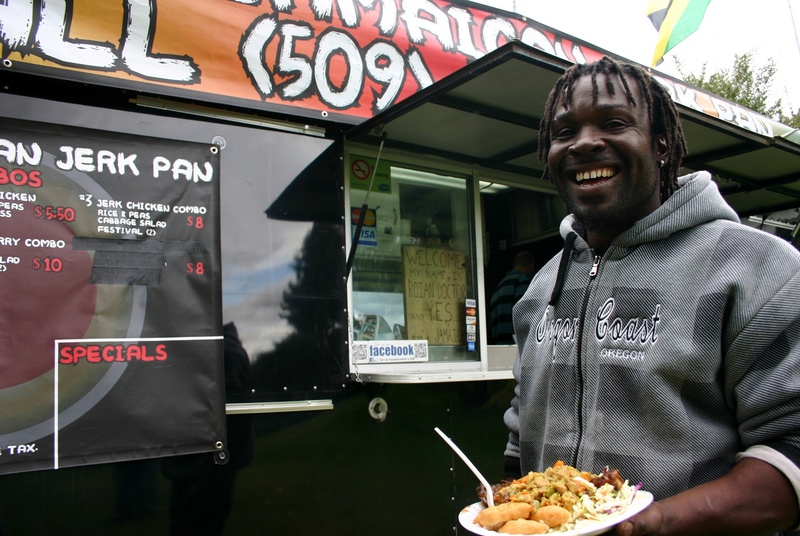 Jamaican Jerk Pan will be up at Green Bluff near Knapp’s Farm during Apple Festival and offers catering services, as well. Hours: Monday-Friday, 11:30 a.m.-8 p.m.
Thai Lunch Box owner Tom Pinyo isn’t new to the Spokane restaurant scene. 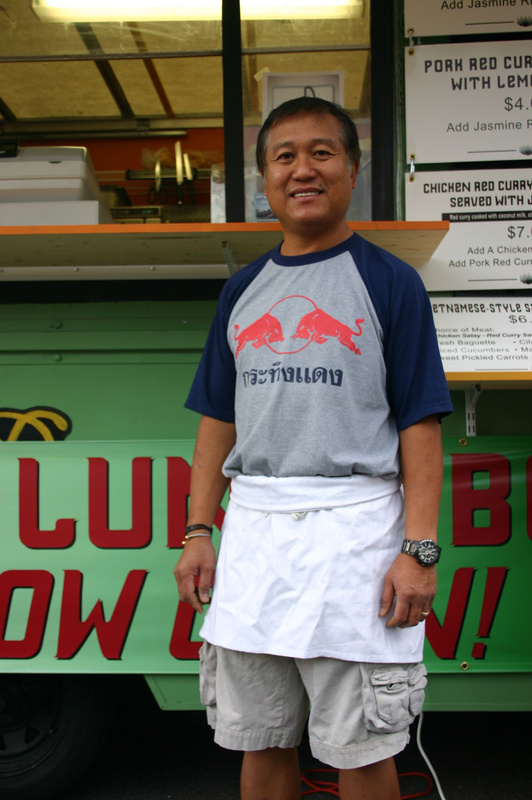 A former owner of Riverview Thai at the Flour Mill, Pinyo has been around the local Thai food scene for many years. But restaurant owners work long hours and Pinyo has two young children. He decided to buy a food truck so he could spend more time with his family. He bought the former Mommy G’s truck, painted it green, and opened at the Perry Street location last month. Staple offerings like red chicken curry with pineapple, and vegetarian pad Thai have proven to be big hits. “On Thursdays and Fridays we offer a special curry, like bean curry with chicken,” said Pinyo. The menu also features chicken satay with peanut sauce, Thai sausage with lemongrass and banh mi, a sandwich featuring a choice of meat topped with cilantro, jalapeños and fresh veggies. Prices range from $3 for a single skewer of chicken satay to $8-$10 for a combo plate which may feature curry, rice and satay or Thai sausage. The sunny fall has been a boon to business, as diners can enjoy the picnic tables Pinyo has set up near the trailer. “We got a really good welcome in the neighborhood,” he said. Hours: Monday-Friday, 11 a.m.-2 p.m., Thursday and Friday, 4-7:30 p.m.
P.H.A.T. stands for Pretty Hot And Tasty. This food truck, which debuted at Pig Out in the Park, is owned by Stoakley Lloyd and his cousins, Avont and LeSean Grant. “We’re still figuring out our schedule and finding the best spots,” Lloyd said. But one thing they have figured out is their menu. “We make the food we like to eat,” Lloyd said. That includes hamburgers made with fresh – not frozen – beef, chicken wings, and pulled pork sandwiches. They also offer the P.H.A.T. Fidel, a Cuban-style sandwich featuring ham, pulled pork, bacon, pickles, Swiss, chipotle mayo, and ground mustard. Built on a hoagie roll and flattened in a panini press, Lloyd said it’s their most popular sandwich. His favorite is the Code Bleu Burger served with bacon, bleu cheese crumbles and bleu cheese slaw. Prices range from $5 for two burger sliders to $10 for the Big Boy, a mammoth burger featuring two patties, bacon, egg and cheese. All sandwiches come with fries or fresh fried potato chips. P.H.A.T. Truck also does catering. It has been parked at the Mead Sports Complex near Market Street and Farwell Road and will be at Green Bluff near Green Bluff United Methodist Community Church during the Apple Festival. You may smell the truck before you see it. “We start cooking the bacon and people start wandering by,” Lloyd said. Hours: Monday-Friday, 11 a.m.-4 p.m.